Sovereign nations must often create a physical boundary which gives reality to the borders of their land. This process, along with related features like patrolling, controlling, erecting signs, and enforcing the movement of goods, people, capital, or even nature across this border, constitute territorialization. Territorialization makes a nation real through construction and implementation of physical barriers along imagined or arbitrary boundaries. The fence that demarcates the international boundary between the United States and Mexico exemplifies this. Borders already exist in nature of course, although they may not be as clearly defined. Boundaries between climate zones, land cover types, or habitat ranges have always existed independent of humans’ desire to draw their own shapes on the land. If territorialization is the physical creation of borders, surely entropy must be the opposing force. Entropy, a return to randomness, to wildness, is constantly working against territorialization. This dichotomy is intrinsic to areas near international borders and especially Organ Pipe Cactus National Monument. The struggle between the environment and the border fence exhibits itself along the thirty-two miles of international border that Organ Pipe Cactus National Monument shares with Mexico. Here, the fence takes on several forms. The vehicle barrier involves simply cementing wooden posts vertically into the ground and binding them together with railroad ties. This type of fencing was installed and completed by the National Parks Service in Organ Pipe Cactus National Monument in 2005 and runs for approximately twenty miles along the international border inside the monument. A second type, the imposing façade of the pedestrian barrier, is a bit more daunting. 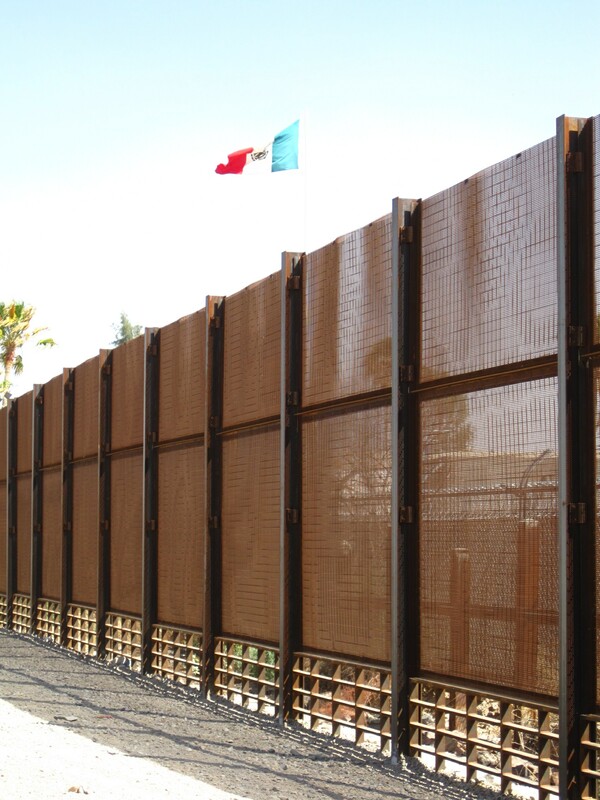 This type of fence, and perhaps wall is a better term, is made up of a double-layered fifteen foot high wall of metal. Areas of this type of fence feature a grated base to allow water to pass through, which we will see has been a failure during flash floods. This fence was completed in Organ Pipe Cactus National Monument as part of the Secure Fence Act passed by Congress in October 2006. When Congress passed the “Real ID” act in 2005 just prior to the Secure Fence Act, language in the bill explicitly allowed the Department of Homeland Security to completely ignore all environmental regulations when constructing an international boundary fence. This particularly forceful method of territorialization has left negative environmental impacts on the monument and the surrounding lands. Large wildlife species such as the Sonoran Pronghorn, Mexican gray wolf, and the reemerging jaguar are now confronted with an impenetrable barrier that cut their population and habitat in half. This, of course, leads to wildlife management problems such as animals venturing far out of their range to find a location where they can cross, and genetic inbreeding as a result of a loss of population exchange. Some estimates put the number of pronghorn left on the U.S. side of the wall at only around seventy-five individuals. Because the species is already endangered, the risk of extinction that is added by fencing these animals out of half of their habitat is considerable. The wall also impedes the natural flow of the floodwaters that occasionally inundate the desert. The rare storms in the Sonoran Desert epitomize the forces of entropy. The fence was specifically designed to allow floodwaters to pass through the wider grates along its base; however, during one of the first natural tests of this system (a rainstorm on July 12, 2008) debris piled up at the base of the fence and blocked the flow. The storm dropped 2 inches of rain in 90 minutes onto the hard, unforgiving ground of the desert causing floodwaters up to 7 feet deep and hundreds of feet wide. Since its natural channels were blocked, the flood flowed along the fence, eroding away the ground along the fence’s foundation and nearby roads until it came to the first available place it could pass through. When the waters reached such a point at the Lukeville/Sonoyta border checkpoint, the torrents damaged structures at the checkpoint and disrupted the cross-border movement of vehicles. The resulting mess received national media attention. Critics such as Defenders of Wildlife blame the waiver of environmental laws during the fence’s construction for producing the disaster. Although it is easy to see the fence’s negative environmental impacts, the positive impacts should not be ignored. Consider, for example, that the fence stops some things which harm the environment: the littering and habitat destruction caused by migration. Year after year countless immigrants brave the desert to find a better life in the United States. Traveling through this rugged land requires bringing supplies for survival, as well as other amenities needed to begin a life in a new country. These people’s impact on the land is not difficult to see: trash-lined trails through the wilderness, discarded clothing and empty bottles, human feces, and habitats destroyed by interwoven networks of informal trails. Along these same lines, drug traffickers with vehicles pay no regard to the delicate land over which they rumble. Additionally, when their trucks fail they are often left derelict out in the wilderness. The vehicle barrier has proven to be very successful at drastically reducing the number of illegal crossings by vehicles, thereby reducing the negative impact on the fragile ecosystem. In Organ Pipe alone, yearly illegal crossings by vehicles have been reduced by over 500 percent according to records from the Department of the Interior. In 2010, monument manager Lee Baiza called the vehicle barrier the best investment the monument has made in a long time. The issue of immigration is often grossly oversimplified for public consumption. Decisions such as allowing the fence builders to ignore environmental protection laws are made by disconnected politicians who may have never witnessed firsthand the destruction of this national treasure. Clearly, a reevaluation is in order for the methods of territorialization being employed here. It is obvious that the pedestrian barrier stops wildlife and disrupts the natural drainage. It is also obvious that it does not stop immigrants from finding ways to cross and pollute the desert. Taking the fence down would invite even more unrestricted illegal immigration and pollution. Add to all this that a territorialized border must be maintained by the State to avoid deteriorating under the forces of entropy, which requires roads, vehicles, workers, and machinery. A new system is needed, and by extension perhaps even a whole new way of thinking about the border. Conceivably the solution lies somewhere between an open desert and a militarized wall. The vehicle barrier is one solution which seems to do more good than harm. It allows wildlife and water relatively unrestricted access while stopping vehicles in their tracks; however, it does little to stem the tide of foot travel. Seeing that the National Environmental Policy Act, Endangered Species Act, Clean Water Act, Wilderness Act, and National Historic Preservation Act have been disregarded for the purpose of territorialization angers many, while the sight of a garbage dump along an illegal trail defacing the delicate and beautiful desert enflames many others. Something must give way; will it be humans and our boxes on the land or the natural splendor of the Sonoran Desert? We must decide before permanent damage is done, as the injured desert takes a lifetime to heal. Fader, Carole. “Fact Check: Trash Lines Many Illegal Immigration Routes.” Florida Times-Union, June 17, 2010. Stephen Dinan, “Environmental Laws Put Gaps in Mexico Border Security,” Washington Times, November 16, 2009. Brian Segee, “Security Without Walls: The Organ Pipe Experience,” Defenders of Wildlife. The Associated Press, “Border Blunder: Security Fence Causes Flooding,” MSNBC. Bethany Walder, “Immigration, Wildlife, and the Wall,” Wildlands CPR, December 4, 2008. Gregory McNamee, “Broken Borders: At Organ Pipe Cactus National Monument,” Wildlife Suffers Advocacy. Burro, “Border-crossing Impact Fragile Desert Environments,” Indybay, San Francisco Bay Area Independent Media Center. Leo Banks, “Border Fence Benefits the Environment,” The Daily Caller.